he world is turning digitally and socially active with more and more number of people engaging through global social networks like Facebook, YouTube, Instagram, Snapchat, Pinterest, and others. Using these mediums consumers tend to look for the other fellow consumers to share their views and opinions about a certain product that helps ease the buying decision. Rather following the brand pages, the people now tend to follow their favorite personalities who put forth their views and opinions and are trusted and credible. Promoting products through these personalities is a great opportunity for marketers and brands to directly connect with consumers. Word of mouth is one of the key drivers for effective sales and business growth. Recommendations given through word of mouth generates more sales compared to paid advertising. Also, the retention rate is 37 percent higher than that of paid ads as these personalities are highly trustworthy and credible to the audience. 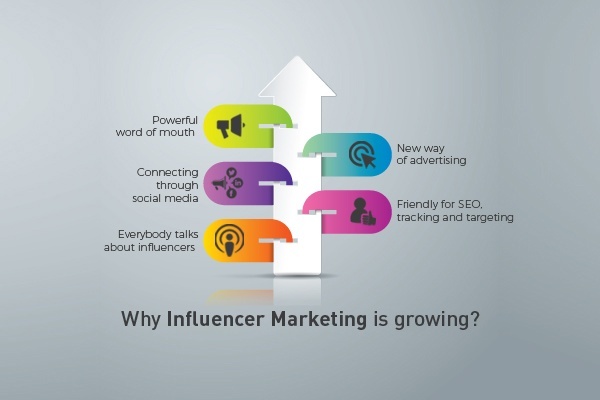 Influencer marketing is a great opportunity for brands to get massive customers through word of mouth, as the people already follow the personality. Social media has made connecting with customers very easier. Also, the purchasing decision has been made easier by providing comparisons, reviews, and learn about the experience with product or service. People want the brands to give out information and entertain them. Influencers are the force through which brands can have organic conversations with its customers. Influencers are the tastemakers or the trend setters for the customers. They communicate the launch of new product or the brands in the market through various mediums which can make your brand a BIG success. A simple article on ten influencers wearing the same dress on the same day can make people go gaga on social media. With the increasing number of traditional advertisement, people have turned ignorant towards the banners. Traditional advertising is interrupting consumer experience, with constant bombarding of ads. While the new way to position brands and products with organic content creates a pleasurable experience for customers as well as a powerful solution for marketing the brand. Besides brand building and boosting sales, influencer marketing also helps you improve your search ranking. The more the mention of your brand, the more it gets popular on google. With the digital and technological advancements, you can track your website visits, social likes, reach, views, etc. which can be a great insight into your target audience and your marketing performance. Social influencer marketing is set to evolve and change the marketing trends. Capitalize on this opportunity and grow your business with the best influencers. Find out a few influencers best for your business and involve them in your campaigns to promote the brand, build trust and reach new followers.